Comic Con San Diego is going to be LIT! It is every year. If you never been to Comic Con SD I'll feel bad for you son, we got 99 events poppin don't miss ONE. This Comic Con Club Crawl San Diego begins at 10PM at Analog Bar. Meet up there at 9:30pm to hit 4 clubs in 1 night. Clubs on the crawl are: Analog, Omnia, Side Bar and Bassmnt. 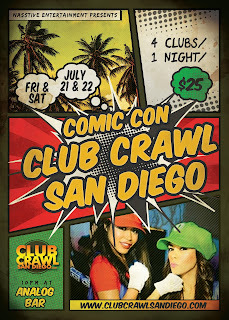 Go to www.clubcrawlsandiego.com for more info. Guest will receive a free welcome shot at checkin. $25 for drinks at all 4 bars. Dress to impress. Costumes welcomed.